Time Of My Life is set exclusively in Calvinu's, a restaurant of ambiguous Mediterranean or middle-eastern origin, where an extended family, the Strattons and various partners, are gathered for an evening meal to celebrate their matriarch's 54th birthday. The play explores the complicated relationships of the Stratton family and reveals both the dark and the positive sides of human behaviour, examining trust, familial loyalty, and laying bare the true character of each individual family member. Gerry Stratton (the father, played by Colin Lawrence) is a man whose business is decaying through poor accounting, Laura Stratton (his wife, the matriarch of the family and played by Sally Marsh) is a woman living in a loveless marriage, and who has had an affair with Gerry's brother some 15 years previously. She has a dysfunctional relationship with both of her sons Glyn (David Foyle) and Adam (Alan Robinson), who struggle with the desire to live up to the success of their father and to earn the love of their mother. The play ends tragically with the death of Gerry, from what we are lead to believe was a car crash brought on by his inebriation, and the failure of Glyn's marriage to Stephanie (Suzanne Jones), Adam's relationship with the totally inappropriate and gold-digging Maureen (Suzi Turton), and the failure of both men's careers. The women come out of it somewhat better! The action progresses in a fragmented series of scenes where the sequence of events is often taken out of chronological order, switching from the present to the past and future, often in mid-scene. Each scene takes place in a different part of the same restaurant, and although confusing to start with, captures the attention and gives reason to each of the events as they unfold. 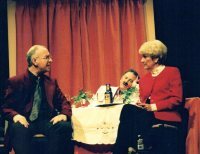 Not one of Ayckbourn's most noted scripts, Time Of My Life is a much under-rated play, exploring uncomfortable themes with humour and power in a way that touches the audience and moves them. Bawds did an excellent job of bringing the whole to life so that the potentially confusing chronological disorder made sense. Directed by Nick Warburton, the actors portrayed each of their characters utterly convincingly and with a confidence that made the family seem totally natural. The pace was excellent, as was the development of each of the characters with time, all the more difficult with such a fragmented order. Despite the somewhat gloomy subject matter, it was also very funny. Delivery was hard to fault and it was only a shame that there weren't more audience members there to laugh on the night. Sally Marsh was splendid as Laura, giving her dialogue the cold and cruel edge it needed to work, whilst at the same time displaying some faint glimmer of love and a strong sense of loyalty to Gerry. Colin Lawrence played her no-nonsense husband perfectly, countering Laura's cynicism with warmth for the rest of the family. 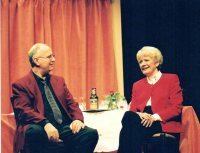 Dave Foyle and Suzanne Jones played out Glyn and Stephanie's relationship beautifully. Suzanne's portrayal of Stephanie's despair at the loss of her husband and her transformation into a new woman was well judged and exceptionally moving. Dave Foyle produced a very touching performance as Glynn, a man trying to remain positive whilst losing everything around him. Suzi Turton as Maureen kept up a hard accent for a southern lass. She and Alan Robinson (Adam) had what seemed the least well written of all of the characters, she as the brash hairdresser and he as the quiet poet. Despite this, they worked together well and turned in very good performances, giving depth to otherwise two-dimensional characters. Under the able command of Calvinu, the restaurant owner (Ron Meadows plus an anonymous moustache), Barry Brown humorously staffed the restaurant with four of his alter egos a.k.a. Tuto, Aggi, Dinka and Bengie (in no particular order). Coupled with a range of dubious wigs, facial expressions and an unidentifiable language, this was a sort of Marx brothers cover version - only funnier. With all of the action taking place in the same restaurant, the demands on the set were more to separate time than to separate space. To cater for this, Tony Broscomb produced a split-level set, which looked the part, worked well and had plenty of space where it mattered. Well-timed lighting changes designed by Ed Hopkins and managed by Ian Bruno moved the attention from one part of the stage to the next, with relatively little distraction from changes of cast or props to slow the pace. It's only fair to note that the Penguins once again put in an enormous effort back and front of stage to produce a polished and professional result. This production was of a very high standard. It had everything needed to provide an excellent evenings entertainment, and was thought provoking and moving to boot. This was an excellent play, well performed, produced and directed. Congratulations to everyone involved.